In a world-first, scientists have drawn inspiration from birds to design an aerial robot capable of altering its profile during flight. To reduce its wingspan and navigate through tight spaces, the robot can reorient its arms, which are equipped with propellers that let it fly like a helicopter. The technology, described in the journal Soft Robotics, paves the way for a new generation of large robots that can move through narrow passages, making them ideal for exploration as well as search and rescue missions. Birds and winged insects have the remarkable ability to manoeuvre quickly during the flight to clear obstacles. Such extreme agility is necessary to navigate through cramped spaces and crowded environments, like forests. There are already miniature flying machines that can roll, pitch, or otherwise alter their flight attitude to pass through small apertures. However, birds illustrate another strategy that is just as effective for flying through bottlenecks. They can quickly fold their wings during high-speed flight, reducing their imposing span, to easily negotiate the challenging paths before them. Deployment of aerial robots in constricted and cluttered areas for search and rescue, exploratory, or mapping operations will become more and more commonplace. They will need to be able to circumnavigate many obstacles and travel through fairly tight passages to complete their missions. 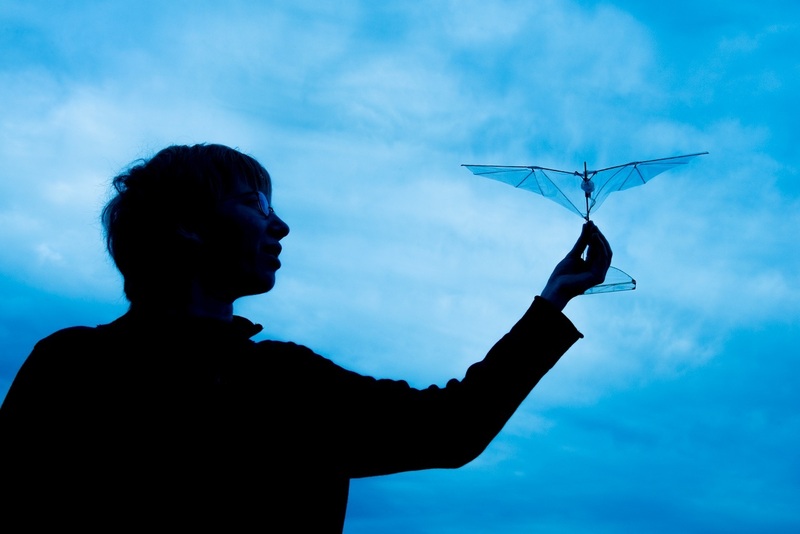 Researchers from Centre national de la recherche Scientifique (CNRS) in France have designed a flying robot that can reduce its wingspan in flight to move through a small opening, without intensive steering that would consume too much energy and require a robotic platform featuring a low-inertia (light and small robot). Dubbed Quad-Morphing, the new robot has two rotating arms each equipped with two propellers for helicopter-like flight. A system of elastic and rigid wires allows the robot to change the orientation of its arms in flight so that they are either perpendicular or parallel to its central axis. It adopts the parallel position, halving its wingspan, to traverse a narrow stretch and then switches back to perpendicular position to stabilize its flight, all while flying at a speed of 9 kilometres per hour, which is pretty fast for an aerial robot. At present, it is the precision of the Quad-Morphing autopilot mechanism that determines the robot's agility. The autopilot activates arm reorientation when the robot nears a tight passage, as determined by a 3D localisation system used at the institute. The researchers have also equipped the robot with a miniature camera that can take 120 pictures per second. In the future, this will allow Quad-Morphing to independently assess the size of the gap before it and fold its wings accordingly if necessary. Flight testing with the new camera will begin this month.